Full disclaimer - I have never ever played this game, on any platform, in any decade. It was only 6 months ago that I learned that the name of the game was not Tessellation. However, in my minds eye, I was always playing the game. When I loaded up my cart at a big box store, I said to the checkout person: I love this, its like a game. When I packed up my suitcase, or folded my laundry, or found room for every skein in the cubbies at Lakeside Yarn, there was a tremendous sense of satisfaction in using every square inch available in a given space for a specific purpose. You might say, creating order out of chaos.. 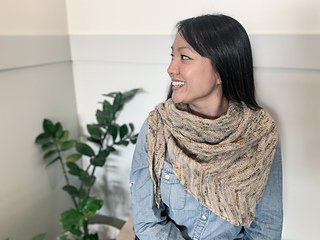 This past year, I have taken Lakeside Yarn on the road a bit, bringing our brand and my designs to Chicago, San Francisco, Minneapolis, and New York. 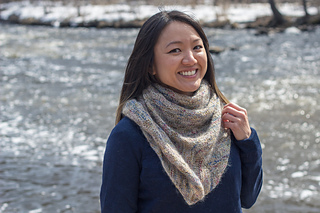 The inspiration for this 2019 Minnesota Yarn Shop Hop design came simply from my dogged determination to fit everything I needed in my Subaru Impreza for Stitches Midwest: there must be a pattern design in there somewhere! 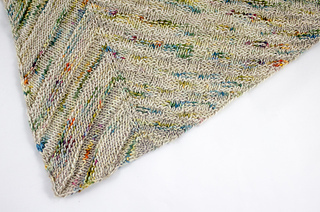 The result is an asymmetric triangular shawl, with rectangles and squares lining up to fill the space. Yet, the nature of hand dyed yarn is that each skein is unique so that no two shawls look alike. Order, plus artistry, is, well, tremendously satisfying. I hope you enjoy the pattern, the yarn, and the process. If you received the paper copy of Woodland Tiles during the 2019 Minnesota Yarn Shop Hop, please click here to download a corrected chart for the Square Tile pattern.